Ignite the power of Partiposters. Want more people to learn about your brand? You’re in the right place. With Partipost, you can easily leverage on the power of Partiposters who will help drive your business to new heights. Nano-influencers like Partiposters are the storytellers of this generation. Their audience trusts them and often look to them for advice on the newest products, brands and services. With Partipost, you can launch a campaign & manage submissions from interested Partiposters all in one place. Find the right audience that fits your brand image. Search for influencers based on your specific requirements, such as interests, followers, age, and more. Control the content your audience sees. You can review and approve submitted posts before it gets published. Partiposters will then receive your approval through our mobile app to begin posting. Who says influencer marketing campaigns all have to be the same? At Partipost, we allow for flexible campaign mechanics to fulfill all kinds of business purposes. Have a fast and efficient workflow with influencers. Say goodbye to tracking submissions on spreadsheets and liaising with influencers over email. 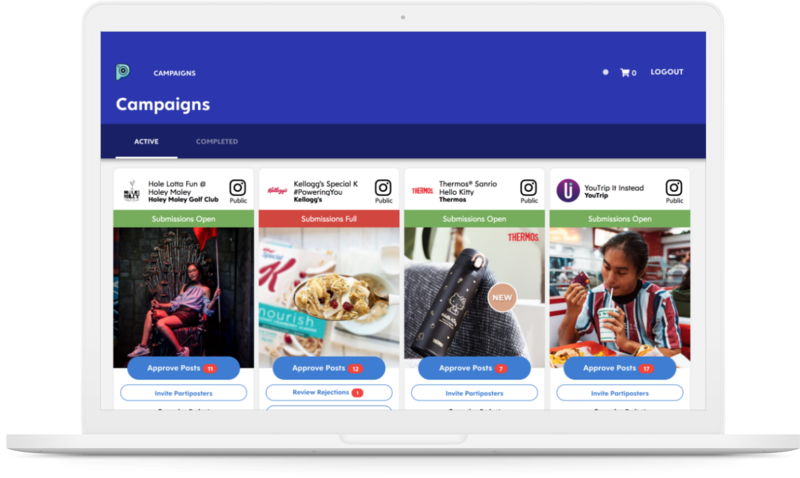 Our campaign manager lets you communicate directly with influencers when approving their posts. How does the Partipost platform work? Select which platform you want to promote your brand on and what type of branded content you wish to see. Once everything is decided upon, your exciting new campaign goes live on the Partipost app, ready to accept submissions. Partiposters will start submitting content for approval. Start reviewing submitted content on campaign manager. Once you start approving content, Partiposters will post it on social media and share it with their loyal followers. Get in touch with our sales team and find out what Partipost can do for your business. Join the growing list of brands on Partipost. Run campaigns the way you want to. Keep your brand safe with genuine profiles. I want to know if you have a particular type of user on your platform to post for my brand. Are you able to find out? We have a data-driven approach to targeting the particular type of user you'd like to use. On top of that, we can run polls on our app to gather responses from our Partiposters/influencers too! What is the lead time to get a campaign started? The faster the brand can approve the campaign brief, the shorter the lead time. In general, campaigns can go up within 1 or 2 days after signing of quotation. Do I get to approve the submissions before it goes live? Yes, all submissions are collated and can be reviewed via our Campaign Manager. Can Partipost ensure that the Partiposters/influencers will not post before the content is approved? While we cannot restrict what they post on their own social media accounts, the payout will only be given to the posts that are approved by the brands as they followed the campaign guidelines and fulfilled the requirements. Do you handle our social media accounts as well? Unfortunately, no, we do not provide this service at the moment. Is it possible to run a campaign for CSR? Definitely. Chat with us to find out more!